Wassa Wassa African Dance and Drum Festival is a three day festival held in September in the heart of the Santa Fe, New Mexico, community Railyard district. The Festival brings together master artists of drumming and dance from countries such as Guinea, Haiti and Zimbabwe, and offers high quality teaching to the local community as well as to dedicated students traveling in from other states. 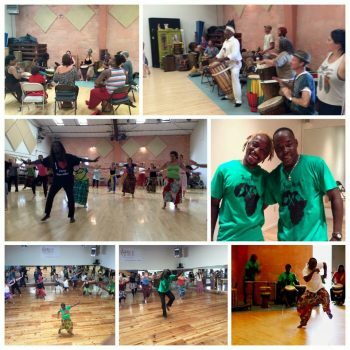 Festival classes include Djembe drumming, Guinea dance, Haitian dance and Doundoun dance, singing and acrobatics. A Saturday evening performance, open to the public, showcases the artists and gives the opportunity for the wider community to experience the unity and joy expressed through this art form. Wassa Wassa! is used as an expression of Happiness in Guinea, West Africa. The aim of the festival is to share this happiness, support the traditional arts of Africa, and educate through the interchange of one another’s culture. Music and dance offers an avenue for non-verbal communication which bridges any divide and paves the way for dialogue to proceed. The art form itself offers the possibility for healing through the powerful cleansing properties of movement and rhythm. Wontanara” is a commonly used word in the Susu language of one tribe of people from Guinea, West Africa which describes the spirit of the Festival: “We are together”.